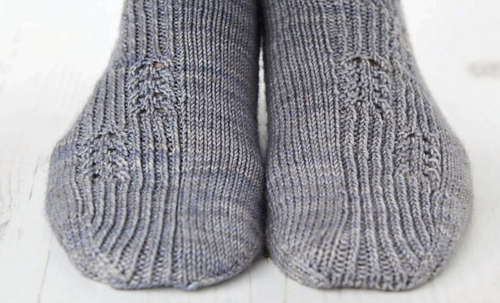 WE ALWAYS love using hand-dyed yarns for our knitted socks, and this subtle-hued 4ply from Fyberspates looks particularly lovely combined with the sinuous stitch pattern on Jane Burns’ socks. Vivacious 4ply is a robust, high-twist pure merino that is machine-washable and comes in both soft shades and saturated brights. 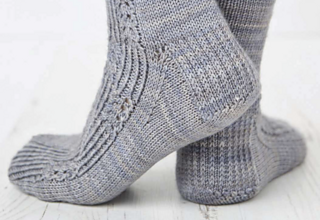 Jane’s stitch pattern blends simple lace with twisted ribbing, and the design is mirrored on the left and right socks, which are knitted from the top down. Round 1: P1, K1tbl; rep from to end. Repeat round 1 until piece measures 2.5cm from cast on edge.